I've read the trade of the first of the four Countdown to Infinite Crisis miniseries, The OMAC Project, and I was wholly impressed. I didn't go in to it, of course, expecting a complete, resolved story, and I also really knew most of the major plot points going in; despite that, Greg Rucka has written a tale with his usual aplomb that is more than just a prelude miniseries, and instead a story about the intersection of the mind, body and heart; of men and machines; and of teamwork -- good teams, bad teams, and just plain evil teams. Rucka shows such wisdom and care in his handling of a wide variety of DC Universe characters -- from the Big Three to also-rans -- that one can't help but be engaged. In The OMAC Project, trouble at Blue Beetle's technology company leads him to discover a brewing conspiracy, but he can't get any of the major heroes to assist him. When Beetle infiltrates a mysterious castle by himself, he finds Maxwell Lord at the center of a new Checkmate; Max proceeds to kill Beetle. Batman's former bodyguard Sasha Bordeaux -- and Max's Black Knight -- turns against Max and alerts Batman of the murder; he reveals to the JLA both Beetle's death, his recollection of being mindwiped by the early Justice League, and his subsequent creation of Brother I, a metahuman-tracking satellite. Batman locates Sasha in one of Beetle's warehouses, and they are attacked by OMACs -- cybernetic monsters built around innocent human hosts. Meanwhile, Booster Gold enlists Guy Gardner and Fire to help avenge Beetle's death. Max uses his mind-control powers to brainwash Superman and attack Batman; Wonder Woman is forced to kill Max to free him. Batman discovers a weapon that Beetle built that would stop the OMACs, and gathers a team of heroes to trap them; Sasha, revealed as cybernetic herself, is able to shut down others, but not before Rocket Red and others are killed. Batman states early on that the mind is the one true thing he can control; the body -- the heart -- can betray you, as with his feelings for Sasha. But we learn that the mind is just as tricky -- not only did the Justice League take Batman's memories from him, but Max Lord's specialty is corrupting the mind. In the end, we're given the sense that perhaps there is a value to the body; when Sasha Bordeaux decries her newfound mechanical status, Batman tells her she's not a machine solely because she can feel. This is complicated, however, by the newly autonomous Brother Eye, who Batman claims can't feel at all -- except it ends the story by taking revenge on Wonder Woman for her killing Lord. I've noticed that in the wake of Brad Meltzer's detailed Identity Crisis, much of the discussion surrounding Infinite Crisis has been in what the "theme" or "point" of the story is -- questions no one asked back in the day of Joker: Last Laugh or Day of Judgment. Greg Rucka uses The OMAC Project to raise some good points and ask some interesting questions, and this alone could have raised OMAC Project above the level of just a typical crossover miniseries. Having just read the "Super-Buddies" trades before reading OMAC Project, I was also thoroughly pleased with how Rucka handled the former Justice Leaguers. Keith Giffen demonstrated in I Can't Believe It's Not the Justice League how these characters, despite all the jokes, truly care about one another; this was perverted, somewhat, when Maxwell Lord shot Blue Beetle in the head. But in a truly inspired moment, Guy Gardner teams up with Booster Gold -- without hesitation, and with all jokes laid aside -- to hunt for Beetle's killer, and when they get in touch with Fire, she's already been searching herself; Rucka also includes Super-Buddy Mary Marvel. I've always thought Booster, Beetle, Fire, Ice, and Guy were the core of the old Justice League, and these are characters who, we can imagine, have been through a lot -- the death of two of their members leaves a somber three behind -- and Rucka does a great job of showing their battle-weary camaraderie. That Rocket Red is killed here just adds to the tragedy, and one can understand completely why he retreats to the future. Booster, Fire, and especially Guy are hard characters to write, with most writers acting as if the silly jokes are all there is; Greg Rucka has instead done these characters justice. I'll save any commentary on Wonder Woman killing Maxwell Lord until after I read Superman: Sacrifice, as OMAC Project doesn't offer much in the way of Wonder Woman's reasoning. Having read Infinite Crisis before OMAC Project, and knowing where most of these threads are leading, I was impressed with the detailed amount of set-up include in OMAC. The Doom Patrol shows up, foreshadowing Infinite Crisis #4; we also see the Freedom Fighters, next seen in Infinite Crisis, and Red Star, Pantha, and Baby Wildebeest of Infinite Crisis #4. Fire's detective work leads in to her new role in Checkmate, while Booster leaves for the future only to return in Infinite Crisis #1. If nothing else, the sheer planning of Infinite Crisis is impressive. 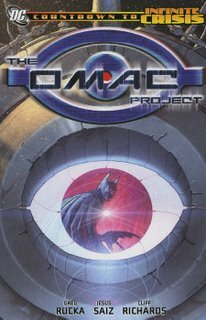 The OMAC Project raises the bar for crossover miniseries; if DC ever has a crossover again (which they will, but can you imagine how they're going to top this? ), they'll have a lot to live up to. The trade is brought down only minorly by the artistic "computer-speak" peppered along the pages, which takes a while to get used to and is often lost in the spine cut-off between the pages; fortunately I got used to it in time, at least, to see what characters the OMACS killed at the end of the book. The text pages explaining "Sacrifice" are good, though "Previously in Sacrifice" is kind of strange wording (though I like the TV-esque quality of it). And the 3.5 chapter begins with its alternate cover -- that of a dead Max Lord at Wonder Woman's feet -- spoiling the end of the chapter for all two people who read OMAC without knowing it's coming. These are small production gripes, however, in a satisfactory story over all. Going to perhaps delve into the Bat-world for a bit, and from there to Day of Vengeance. See you!